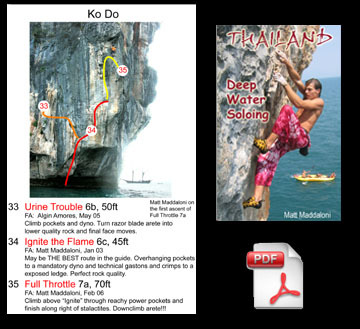 100 routes with 25 new ones and many new areas including; Ko Hong East near Ao Nang and Ko Hong West near Phuket, Phi Phi Islands, Railay area, Koh Yao Island and areas near the famous Phang Nga National Park. A total of 100 well documented routes on 40 islands with clear text, newly enhanced map descriptions, and colored photographs. Even new route potential is mapped out to guarantee that the adventure is turned up to full volume! The PDF enables you to zoom in for incredible detail or print off pages of the whole book to take with you.